If you like accurate rifles and reactive targets, you’ll enjoy this 48-minute video from Shooting USA TV, which features long-range varmint silhouette competition in Texas, the Lone Star State. We have participated in these kind of matches on the West Coast — they are definitely a ton of fun. The sport combines the pure accuracy of benchrest competition with the fun of knocking down critter targets. These are smaller than standard silhouettes, so it’s quite a challenge to hit them at 300 yards and beyond. In this episode, host John Scoutten competes with his 6.5 Creedmoor PRS rifle. He found that 1-MOA Coyotes offered plenty of challenge at 385 meters! Most shooters use benchrest-grade rifles with premium front rests. EDITOR: We strongly recommend you take the time to watch this Shooting USA feature — it shows some top-flight benchrest rifles, and also covers the origins of benchrest varmint silhouette in Pennsylvania. There are even some AccurateShooter Forum members on screen. John Scoutten also does nice job explaining the challenges of shooting this discipline with a PRS rig. We think any benchrest or tactical shooter will really enjoy watching this video. Travis Frazier of Field & Cave Outfitters says shooters love the reactive targets: “The most exciting thing is seeing your hits — these [targets] really go airborne”. Yep, that’s the best thing about Varmint Silhouette matches — hits deliver instant gratification. Travis designs and produces these steel targets. This Texas match features multiple target shapes, 10 at each distance: Tiny Prairie Dogs at 200m, 3″x3″ Armadillos at 300m; 3″x5″ Coyotes at 385m; 5″x4″ Hogs at 500m; Chickens (on swingers) at 600 yards; and Pigs (on Swingers) at 750 yards. Competitors are allowed 10 rounds and 10 minutes to hit each set of targets. Share the post "Varmint Silhouette Competition in Texas — Video Feature"
If you watch just one episode of Shooting USA TV this year, it should be this week’s SHOT Show Special. Tonight, March 6, 2019, enjoy a full hour of SHOT Show coverage at 9:00 pm Eastern and Pacific, 8:00 PM Central. Jim Scoutten’s team work hard every January, bringing you highlights from the gun industry’s largest trade show. Jim, son John Scoutten, and other staffers prowled the 12 miles of aisles in the Sands Convention Center in Las Vegas, visiting many of the 1,600+ exhibitors. This episode provides a “first look” at the new guns, optics, and gear introduced for 2019. Click HERE to learn more about this week’s 2019 SHOT Show episode. 2019 SHOT Show Highlights: Ruger Precision Rimfire, Hornady 300 PRC, JP MR-19, Kestrel HUD, Manners Stocks, Savage MSR-10, Volquartsen Ultralite, Walter Q5 Match, and much more. Shooting USA’s SHOT Show Special will air for a full hour on Wednesday, March 6, 2019 on the Outdoor Channel. Here are the air times, but you should check your local schedule. Look for Shooting USA TV on the Outdoor Channel. Share the post "SHOT Show 2019 — Shooting USA TV Product Showcase"
This Wednesday, November 14th, Shooting USA TV features The Brawl at Rifles Only, a tactical competition that draws top long-range shooters from military, law enforcement and civilian shooting communities. The match is held at the famed Rifles Only range in Kingsville, Texas. The Brawl is a one-of-a-kind physical and mental challenge that tests shooters’ abilities to read wind, figure ballistics, and adapt to difficult shooting scenarios. There is even a helicopter stage. This Shooting USA episode airs on the Outdoor Channel at 9:00 pm Eastern and Pacific, 8:00 pm Central. Share the post "Brawl at Rifles Only on Shooting USA TV This Week"
Shooting USA will broadcast a great episode today, August 1, 2018. There are three segments worth watching. First the TV show spotlights the popular GAP Grind, a Pro-Am PRS event at the K&M Precision complex in Tennessee. Then this episode covers the CMP Western Games at Ben Avery in Phoenix. Finally John Scoutten reviews two new 6.5 Creedmoor Savage rifles. This Shooting USA Episode airs August 1, 2018 (Wednesday) at 9:00 Eastern and Pacific; 8:00 Central. The GAP Grind, the biggest PRS match in the country, is a notoriously challenging, “high tempo” match with minimal down-time between stages. Over the course of 20+ stages, competitors will fire 200+ shots at a variety of steel, paper, moving, and reactive targets out to 1,200 yards. Targets vary in size/difficulty based on the shooter’s position, distance, and time allotted. Most stages include “stressors” — i.e. time limits or required movement(s). The GAP Grind attracts over 300 competitors — half experienced shooters and the other half newcomers to the sport. The key to growing the shooting sports is attracting new shooters. The best way to bring in “new blood” seems to be the Pro-Am type format. At the GAP Grind, experienced shooters guide the new shooters through the competition and hopefully keep them coming back. John Scoutten is paired with new shooter Kevin Nassery who says he thinks the biggest advantage is not necessarily the course of fire, or the targets, it’s the spotting. “Pros don’t get any support to know where they hit or missed. They have to see everything themselves. I think that’s the biggest difference between the courses of fire”. The Civilian Marksmanship Program (CMP) was established by act of Congress in 1903, with the purpose of teaching shooting skills to American citizens. The Western Games at the Ben Avery Facility North of Phoenix draws enthusiasts from many Western states for competition with Service Rifles, vintage military rifles, M1 Carbines, and Rimfire Sporter rifles. Along with numerous matches (including the Vintage Sniper Team match), the Western Games features Small Arms Firing School (SAFS) shooting clinics. “Our mission is to teach marksmanship and give the citizens of the United States the opportunity to learn marksmanship, with an emphasis on youth”, states Mark Johnson, CMP Chief Operating Officer. A Small Arms Firing School (SAFS) is conducted each year. Checking out the line-up of M1 Garands at the CMP Sales tent. In this review segment of today’s Shooting USA episode, John Scoutten reviews two new 6.5 Creedmoor rifles from Savage Arms. The Model 10 BA Stealth is a short action bolt gun priced at $1,207 MSRP. The MSR 10 Long Range is am AR-platform semi-auto priced at $2,284 MSRP. Both rifles showed good accuracy with factory ammunition. For this test both Savage rifles were topped with Bushnell Elite LRTS optics. Share the post "Great Shooting USA Episode — GAP Grind and Western Games"
The GAP Grind is one of the most popular tactical matches on the planet. So popular, in fact, that this 3-day Pro-Am event will likely “sell out” this year — with more interested shooters than available slots. To ensure you get a spot at the 2018 GAP Grind, which runs October 5-7, 2018, register early. GAP Grind Registration opens June 1st, 2018 at 9:00 am CST. The 2018 Grind will take place at the K&M Precision Rifle Training Shooting Complex in Finger, Tennessee. If you haven’t experienced major PRS Pro-Am event like the Grind, with hundreds of talented shooters, check out this video from ShootingUSA. Show host John Scoutten provides a competitor’s perspective. Share the post "Register for GAP Grind — The “Granddaddy” of PRS Matches"
Broadcast Times: Wednesday 9:30 PM Eastern Time; 1:30 AM ET (Thurs). Earlier in Central, Mountain, and Pacific Time Zones. Check your local listings for the Outdoor Channel. In this episode, Shooting USA features the Vintage Sniper Match at the CMP’s Talladega Marksmanship Park. This is a popular two-man team event, for shooter and spotter, using military rifles in service up to 1953. One added challenge is the time limit. The team has only 20 seconds to complete each shot — That’s 20 seconds for the spotter to read the conditions, and for the shooter to pull the trigger. File photo from Vintage Sniper match at Camp Perry. At Talladega, there are video target monitors at each shooting station. Who can identify this vintage European rifle, with its unusual scope mount? NOTE: This 11/29/17 Shooting USA episode is a double feature that includes coverage of the GAP Grind, the biggest PRS tactical match of the year. Official called the Bushnell GAP Grind Pro-Am, this is a tough tactical/practical match in Tennessee with 300 competitors. Conducted in association with the Precision Rifle Series (PRS), the GAP Grind features a Pro/Am format — new shooters partner with an experienced shooters for the two-day, 25-stage event. For the featured event, Shooting USA’s John Scoutten teamed up with novice shooter Jen Hodson. Share the post "Vintage Sniper Rifle Match on Shooting USA TV Today"
Here Todd Jarrett nails three steel targets and a pop-up orange clay bird. Watch full video below. If you are a fan of 3-Gun competition, tune in to Shooting USA this week. The latest episode, which airs Tuesday October 3 and Wednesday October 4, features the 2017 USPSA Multi-Gun Nationals in Boulder City, Nevada. You can see many of the nation’s top 3-Gun shooters attacking some very challenging stages with pistols, rifles, and shotguns. CLICK HERE for TV Schedule. Image from Sierry Whiskey Video from 2017 USPSA Multi-Gun Nationals. Multi-gun competition has evolved considerably since it started 30 years ago. The firearms are more sophisticated, the optics are better, and the stage times are much faster. Still, the challenge remains the same: How fast can you shoot multiple targets, with the score determined by speed and accuracy? For the best in the sport, the answer is very fast indeed, but Match Director Pete Rinsing has a few tricks up his sleeve to challenge competitors on never-before-seen courses of fire at the USPSA Multi-Gun Nationals held in April 2017. Most people compete in the Tactical Division, including 8-time Champion, SFC Daniel Horner of the U.S. Army Marksmanship Unit. Competitors in that division are not allowed a bipod, so many competitors utilize structures on the stage to stabilize their long gun. Regardless of division, the USPSA Multi-Gun Nationals is a true test of manipulating three different weapons, under pressure, on run-and-gun courses of fire. And the pressure is definitely on when a National Championship is on the line. Share the post "2017 USPSA Multi-Gun Nationals on Shooting USA TV"
The 2017 Fort Benning Multi-Gun Challenge will be held November 16-19, 2017. This year there will be at least 12 stages, plus more than 40 guns on the prize table! Rifle, pistol, shotgun. More guns = more fun. If you are curious about multi-gun matches, check out this video from Shooting USA. This episode covers the 3-Gun Match at Fort Benning, Georgia. 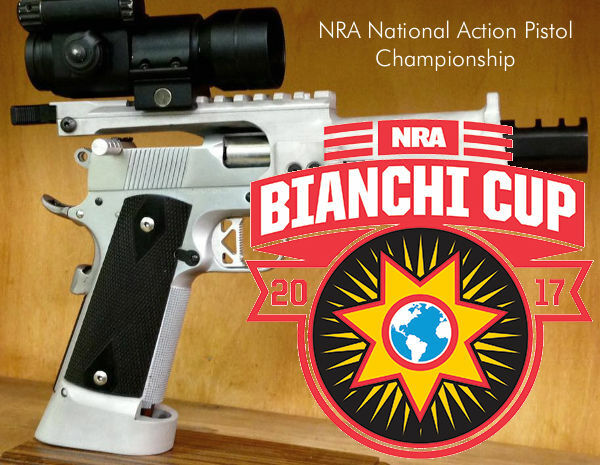 This one-of-a-kind match is the only multi-gun competition where civilians can run-and-gun on an active U.S. Army installation. What’s more, at this match competitors get to ride in a Stryker armored vehicle and shoot Army weapons such as the M249 SAW and M203 Grenade launcher. The lure of playing with military hardware, along with the quality of the stages, makes this a hugely popular 3-Gun event which quickly sells out every year. Thinking of getting started in 3-Gun competition? In this NSSF video, Top Shot Finalist Chris Cerino reviews the hardware you’ll need for multi-gun matches. Chris talks about carbine configurations — including barrel, handguard, and optics options. In reviewing shotguns, Chris discusses shotshell caddies and the high-capacity extended tubular magazines now available. Cerino also demonstrates pistol techniques and explains the key features of a belt/holster rig for 3-Gun competition. Everyone practicing with shotguns, rifles and pistols must keep safety as top priority. “Obviously, safety is the No. 1 priority, but after that, the focus should be on developing specific skills,” noted Horner. A good three-gunner must not only be fast, but he or she must also be accurate and be able to adapt to a wide variety of shooting positions. And strategy is involved too. Successful 3-gunners develop a ‘plan of attack’ for each stage. Share the post "Fort Benning Multi-Gun Challenge on Shooting USA"
If you like accurate rifles and reactive targets, you’ll enjoy this episode of Shooting USA TV, which features long-range varmint silhouette competition in Texas, the Lone Star State. We have participated in these kind of matches on the West Coast — they are definitely a ton of fun. The sport combines the pure accuracy of benchrest competition with the fun of knocking down critter targets. These are smaller than standard silhouettes, so it’s quite a challenge to hit them at 300 yards and beyond. In this episode, host John Scoutten competes with his 6.5 Creedmoor PRS rifle. He found that 1-MOA Coyotes offered plenty of challenge at 385 meters! Most shooters use benchrest-grade rifles with premium front rests. This episode also includes the Rimfire Challenge World Championship in Alabama (starting at 33:25). This event attracts hundreds of shooters who ring steel with .22 LR rifles and pistols. This may be the ultimate fun match for the whole family. Many of the top shooters are juniors, who can run the all-steel stages in three seconds. The 16 stages each have 5 to 8 steel targets that can be shot in any order, but the last round must go on the red-marked “Stop Plate”. This week’s gun history segment of Shooting USA features the Remington 700, one of the most successful bolt-action rifles ever, with over 5 million produced. The Rem 700 has served hunters, military marksmen, and Rem 700 actions have been used for countless competition rifles. Share the post "Shooting USA Spotlights Texas Benchrest Varmint Silhouette"